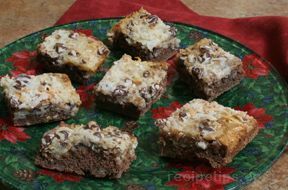 These homemade Mounds Bars are so moist and have that scrumptious combination of chocolate and coconut that you just can't refuse. 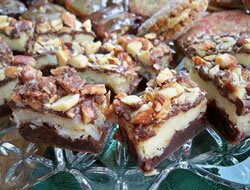 If you like coconut you will love these bars. Make Brownie mix following directions on box. Pour in 9x13 baking pan; set aside. 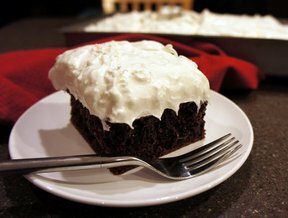 Use an electric mixer and mix coconut, cream cheese, flour, sugar, eggs. Mix until blended. Pour over brownies, spread evenly. Bake 30-35 minutes at 350. 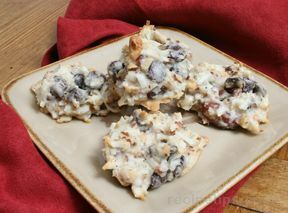 Remove from oven and sprinkle chocolate chips on top evenly; return to oven for 1 minute to soften chips. Spread chocolate evenly. Sprinkle with almonds. Cool and cut into bars. "Delicious! I loved these bars. They taste a lot like an Almond Joy candy bar with the almonds on top. If you like coconut, you will love these bars."